While the Democratic National Committee and other liberal organizations are dropping their affiliation with the Women's March on Washington over allegations of antisemitism, a separate women's march in Denver is distancing itself from one of its controversial leaders. Separately, the website says march organizers included an "x" in the word "woman," "because we believe in equity and we act with purpose to make space for trans, non-binary, and genderqueer persons in our name." O'Grady's bio originally highlighted her "25 years as a special agent in the mostly white, male-dominated field of federal law enforcement," and argued she was "a witness to the fact that institutionalized disparities and unconscious biases continue to prevent women and minorities from obtaining equality in the workplace and in the criminal justice system." After the Free Beacon contacted organizers of the "Womxn's March," the above was deleted. By Monday, her bio was removed entirely. O'Grady in recent months boasted to other agents that she "beat" the agency's misconduct charges for the anti-Trump Facebook posts and has said she planned to retire when she reaches a key retirement milestone date in 30 to 90 days, according to multiple sources close to the Secret Service. O'Grady's name still appears on an internal agency "locator" of all active Secret Service agents and their contact information without any type of restriction or qualifier listed, the sources said. Reports of O'Grady Facebook posts sparked a media firestorm in 2017, fueling additional turmoil and morale problems in the Secret Service. O'Grady was sidelined from her then-role as the head of the Denver office and the agency launched a disciplinary investigation into her actions. The Secret Service has declined to comment on the status of that investigation even as the Free Beacon has reported that O'Grady remains living in Denver on paid administrative lead and never lost her security clearance. O'Grady did not respond to an email to her Secret Service email address seeking comment. Before removing her bio and photo from the website, the Denver march organizers said they would pass along the Free Beacon‘s questions to O'Grady. A spokeswoman for the march did not respond to a question about whether she knew if O'Grady has legal permission from the Secret Service to participate in the march's organization or if O'Grady is still employed by the agency. Organizers followed up by issuing a statement from Angela Astle, a member of the march's leadership team. 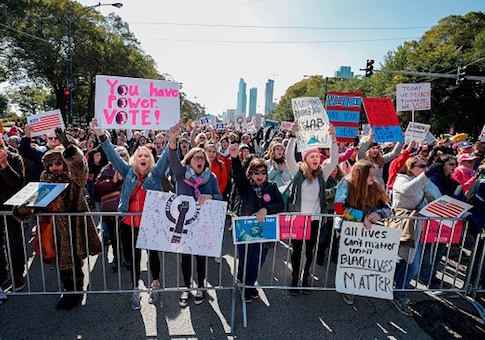 The statement noted that the march is a nonprofit committed to "uplifting womxn and all those who have been marginalized and oppressed" and said that all of its members "are unpaid volunteers and are committed to the highest ethical standards." On Tuesday, Denver march spokeswoman Patricia Smith did not respond to an inquiry into why the website no longer includes any references to O'Grady. Smith did stress that the "Womxn's March" has no formal affiliation with the national women's march and has done "all of its own fundraising." "The Womxn's March Denver is an independent grassroots organization that became a 501(c)3 organization in November 2018," she said. "There is no affiliation with other march organizations, no shared leadership, nor financial support from other marches." Sources close to the Secret Service say O'Grady's "leadership" role in the march's organization when she appeared to remain on paid administrative leave has fueled further backlash at an agency that for years has suffered one of the lowest levels of morale in the federal government—morale problems that the government shutdown is exacerbating. During the government shutdown, all agents have to show up to their office each day. If they call in sick or take a vacation, they will not be paid when the government shutdown ends. "It's just another slap in the face of the Secret Service employees that know they would be fired for much less," one source told the Free BeaconTuesday. "She originally committed one of the worst acts an agent can do in her comments that she wouldn't take a bullet for this president. That's dereliction of duty." "And now she appears to be being allowed to retire," the source continued. "People have done much less and they have lost everything. When does it end?" The controversy over the national women's march continued Tuesday when the Democratic National Committee joined a longer list of liberal organizations dropping their affiliation with the Women's March just days before it the group's third annual march on Washington, D.C.
Sens. Kirsten Gillibrand (D., N.Y.) and Kamala Harris (D., Calif.), who both served as speakers at the 2017 women's march in Washington, are not expected to attend the march. The exodus began Monday after one of the march's leaders, Tamika Mallory, refused to condemn Nation of Islam leader Louis Farrakhan's anti-Semitic statements. "I don't agree with many of Minister Farrakhan's statements," she said in an interview with ABC's "The View," although she repeatedly declined to denounce or condemn them. March leaders Carmen Perez and Linda Sarsour also have been criticized for their associations with Farrakhan, who the Anti-Defamation League has described as "America's leading anti-Semite." This entry was posted in Issues and tagged Women's March. Bookmark the permalink.